The Diamond Sutra (Vajracchedika-prajñāpāramitā-sūtra), «The Perfection of Wisdom Sutra that Cuts like a Thunderbolt,» is a short Mahayana sutra of the Perfection of Wisdom genre, which teaches the practice of the avoidance of abiding in extremes of mental attachment. 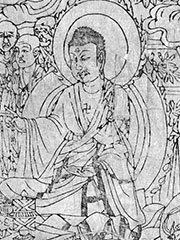 A copy of the Diamond Sutra, found sealed in a cave in China in the early 20th century, is the oldest known dated printed book, with a printed date of 868 CE. There is a wood block printed copy in the British Library which, although not the earliest example of block printing, is the earliest example which bears an actual date. It was found in 1907 by the archaeologist Sir Marc Aurel Stein in a walled-up cave near Dunhuang, in northwest China. The cave is known as «Caves of the Thousand Buddhas.» The colophon, at the inner end, reads: Reverently made for universal free distribution by Wang Jie on behalf of his two parents on the 13th of the 4th moon of the 9th year of Xiantong (i.e. 11th May, CE 868). This is about 587 years before the Gutenberg Bible.